Christopher Fletcher is a product specialist with Tower Metalworking Fluids, Chicago, IL: 773/927-6161; www.towermwf.com. Aluminum heatshields not only protect against heat, they also reduce vehicle noise emissions. In this photo from Autoneum, we see a perfect application where selecting the right lubricant for stamping the aluminum will help ensure maximum performance in the press, as well as compatibility with the aluminum alloy at hand, and ease post-processing work such as welding. Aluminum use in metalforming applications continues to rise, and not just by automotive-parts makers. Other industries also eye the advantages in utilizing aluminum alloys. Metalformers dealing with this evolution must pay attention to numerous process stages, including tool design and build, and the lubrication strategy applied in the pressroom. Selecting the right lubricant for aluminum stamping will help ensure maximum performance in the press, as well as compatibility with the aluminum alloy at hand, and ease post-processing work such as welding. Accompany those lubricant selection criteria with best-in-class health, safety, and environmental impact and you’ve got a big chip in the game of stamping or drawing aluminum. For many years, straight oils, mineral-based soluble oils or emulsions, and dry-film lubricants ruled the aluminum-stamping market with respect to performance. They have been the standard when trying to prevent friction between the aluminum workpiece and the tool steel. Straight oils, while great performers, fall behind the others when it comes to cost and secondary-process compatibility. Dry films, meanwhile, require special application methods, can build-up on die components and sometimes can prove difficult to remove. Therefore, soluble oils/emulsions have become the popular choice for aluminum-stamping applications. Those oils, which contain chlorinated paraffins (CLPs), lead the way for their ability to stretch aluminum to its highest elongation point. Combined with good barrier and extreme-pressure (EP) protection, they allow the material to slip and flow during deep-draw processes. These compositions also help reduce the impact of the aluminum-oxide layer on the surface of the substrate, which naturally adds some abrasiveness. Stampers often form lighter-gauge aluminum parts using disappearing compounds as lubricants. These formulations find use when producing clean parts where the stamper seeks to eliminate post-stamping parts cleaning. Traditional disappearing compounds use petroleum distillates as a carrier for a variety of boundary film lubricants. However, in addition to flammability concerns, these petroleum distillates evaporate into the air and create volatile organic compounds (VOCs). New to the market, VOC-free disappearing compounds produce parts that can move directly to assembly or packaging without cleaning. 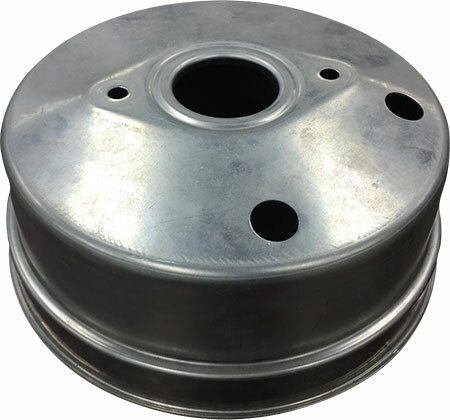 For example, to manufacture the heat shield depicted in the photo on the previous page, the stamper changed from a petroleum-distillate vanishing product to a nonhazardous type, improving employee safety and the plant environment. Vegetable and many other types of renewable-resource-based soluble oils also have begun to make a targeted impact in the aluminum-forming market. In many cases they meet or exceed the performance of mineral-based soluble oils, while offering a non-petroleum-oil environmental advantage. The seed-oil base forms a strong boundary film when adsorbed onto the aluminum surface, preventing metal pick-up and allowing good sheetmetal flow. Whether a mineral- or renewable-resource oil-based lubricant, new chlorine-free soluble oils now are pushing the envelope on aluminum-stamping applications. As an example, consider that for several years, an automotive-parts supplier formed parts from 0.055-in.-thick Type 5754 aluminum, with a 4-in. draw depth, using a chlorinated-paraffin straight oil. By switching recently to a chlorine-free soluble oil, diluted 4:1 with water, the stamper eliminated sporadic tearing and galling while reducing lubricant use and cost. Furthermore, it eliminated all cleaning and application issues. Automotive-parts suppliers that typically deep-draw aluminum (shown here) using a chlorinated-paraffin straight oil can switch to a chlorine-free soluble oil and eliminate tearing and galling concerns while reducing lubricant use and cost. Now, don’t count out full-synthetic chemistry just yet. While older synthetics containing no petroleum or vegetable oil have lagged behind soluble oils, many newer products have risen to the occasion. Packed with newer polymer- and ester-additive technology, today’s full synthetics also prevent the pickup and drag normally experienced when forming aluminum. As with most other substrates, compatibility with the stamping lubricant is of great concern with aluminum, especially when diluting the lubricant with water. Although ferrous staining and corrosion aren’t of concern here, metalformers will prefer to avoid any staining or pitting beyond the normal aluminum-oxide layer buildup. Different alloys and finishes come with varying built-in corrosion resistance. For example, Types 5052 and 6061 aluminum offer excellent corrosion resistance and find use due to their good formability. However, higher-strength alloys such as Types 7075 and 2024 offer average or poor corrosion resistance. When dealing with different alloys, certain lubricants are naturally passive while other lubricants must be buffered for pH and include additional corrosion inhibitors to prevent excessive attack on the substrate surface. Straight oils can offer very good corrosion inhibition due to the absence of water. Dry films also perform well, once any water carrier has evaporated. The extent of corrosion from water-soluble lubricants can vary depending on the pH of the water and the lubricant, as well as water quality and the additives in the product. Higher alkalinity can destroy the aluminum-oxide protective layer, which leads most water-soluble products to require corrosion inhibitors for proper protection. To minimize the propensity for staining or corrosion in metalforming aluminum, metalformers should perform quick stain tests on the substrates. To carry out these tests, mix the water-soluble lubricant to the desired concentration, then cut an aluminum coupon and submerse it half-way into the diluted lubricant. After 24 hr. soaking at room temperature, inspect the coupon for staining and discoloration. After forming, the presence of lubricant residue on the stamped aluminum parts can impact secondary processes such as cleaning, welding and painting. Depending on the severity of the forming, the remaining residue may be heavy or light, oily or sticky, thick or thin, and possibly pooled in corners or all over the part. Whatever the state, the stamper may have to plan for secondary processing to remove the residue. In most cases with straight oils and dry films, the job calls for a solvent or high-alkaline water-based cleaner to remove the residue, as even the slightest amount of residue can impede welding and painting. For difficult forming operations requiring a straight oil, the stamper can opt for a lubricant with a special additive package to allow for quicker, simpler cleaning in an alkaline parts washer run at a relatively low temperature. Soluble oils and synthetics with higher dilution ratios can leave minimal and dry-to-the-touch residues that, in many cases, can be welded through, depending on the composition and dilution required for forming. However, most residues, even if heavy, will wash off in a mild-alkaline cleaner or water rinse. Regardless of the cleaning method selected, stampers must exercise caution. Perform tests on parts to ensure that the cleaning solution does not cause an adverse reaction, such as etching or staining of the workpiece material. Aluminum use continues to expand, not just for its favorable strength-to-weight ratio, but also for its environmental advantages. So, why not apply this philosophy when selecting the optimal lubricant? We should advance beyond just looking for the best forming lubricant that performs well during secondary processing. Newer lubricants also can improve operator health and safety, and positively impact the environment. EP agents continue to find use in fluids to help with carrying the friction load between the aluminum workpiece and the tooling materials. CLPs have been the talk of the industry lately, with the recent push by the EPA to ban medium- and long-chain CLPs based on data suggesting high bio-accumulation and persistency rates. While this debate continues, lubricant manufacturers have begun to look at EPA-approved and registered very-long-chain CLPs to diminish environmental bio-accumulation and persistency rates. Other robust additives that reduce the reliance on traditional EP agents also have made headway into modern formulations, creating more eco-friendly stamping lubricants—not just environmentally friendly, but also friendly to users. With the GHS system in place now for a few years, safety datasheets reveal the potential hazards of a product with written warnings and pictograms.